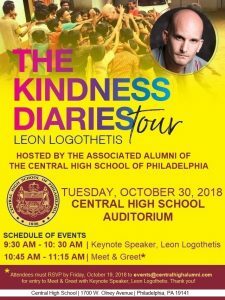 Leon Logothetis, motivational speaker and philanthropist, has been confirmed as the Keynote Speaker at Central High School on October, 30th 2018. 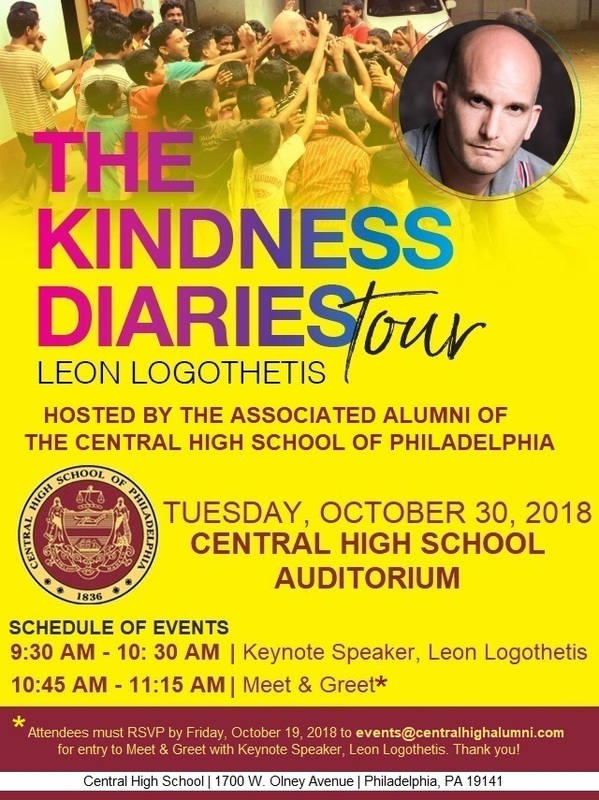 Leon’s visit will be a part of The Kindness Diaries Tour; he will provide insight into his life and his own struggles with being bullied. Leon’s speaking style encourages interaction with the audience and inspire others to act in kindness. Leon Logothetis is most notably known for The Kindness Diaries on Netflix™. In this televised series he sets off on a mission traversing the world to spark a revolution through the act of kindness. The event promptly begins with the keynote address at 9:30 a.m in the Auditorium at Central High School followed by a Meet & Greet at 10:45 a.m. held only for guests who RSVP by email no later than Friday, October 19, 2018 at events@centralhighalumni.com. The AACHS Programs Committee hopes to host similar events in the future as we endeavor to provide content of relevant topics to the students of today and fellow alumni of tomorrow. We hope you will join us at Central High School on Tuesday, October 30, 2018. Thank you.